I had just arrived to camp for the night, roughly 30 miles from the trailhead, and low and behold one of the most beautiful sunsets I have ever seen was just starting to ignite in the early evening sky. It was as if any and every color I had ever seen was being brushed onto a pale blue canvas over my head; purples, yellows, reds, oranges, blues, you name it. It was there. There was a warm summer breeze casually dancing through the trees and I was completely alone. It was serenity and solitude at its finest. I reached for my camera and as I hit the power button a familiar icon and message appeared on the display that read “change the battery pack”. I thought to myself, no worries, I’ve got a spare. I snagged the spare battery from my pack, swapped it with the dead one in my camera and hit power. That was as close as I got to capturing the sunset from that evening. You see, rechargeable batteries weren’t exactly reliable yet, and as a result I was forced to sit there and view that sunset through the only working lenses I had left; my own two eyes. Thankfully, moments like the one I’ve just described don’t have to be the status-quo when it comes to adventuring through the backcountry or traveling to the more remote corners of the world. Meet the sunjack. If you’ve ever spent any significant time off the gird, where the availability of power doesn’t exist and the ability to recharge essential equipment just isn’t an option, than you know that having a mobile solar charger such as the sunjack can make all the difference. Not only is this device light weight, it’s both durable and reliable. Meaning, it meets the three most critical criteria when it comes to backcountry enthusiasts and their gear. This product is rock solid all around and I’d highly recommend it to anyone who’s thinking of investing in such a piece of equipment. It can charge just about any device so long as it can be connected via a standard USB cable, and doing so is as easy as it gets. All you have to do is plug your device (such as phone, tablet, GPS, camera, etc.) into one of the two charging ports on the battery and press the button. That’s it. After turning on the battery pack, blue LED lights will illuminate to show you just how much charge is left (there are five lights with each light representing 20% of battery life). This way it’s easy to see just how much power you have left in storage, and even if your battery pack runs out you can plug your devices straight into the solar panel itself (it also features two USB charging ports). All you have to do is lay out your solar panel and plug in your device (wether it’s the battery pack or an electronic device they’ll instantly begin charging). This is by far the easiest solar charging device I’ve ever used and I’ll definitely be taking it with me the next time I head into the backcountry. But don’t just take my word for it, snag one of these for yourself and you’ll see just how awesome the sunjack really is. After all, had I had one of these when I sat down to enjoy the sunset that evening, I’d have a picture to show for it. But the uses of this device aren’t only limited to the backcountry, it’s even practical for your day to day life. 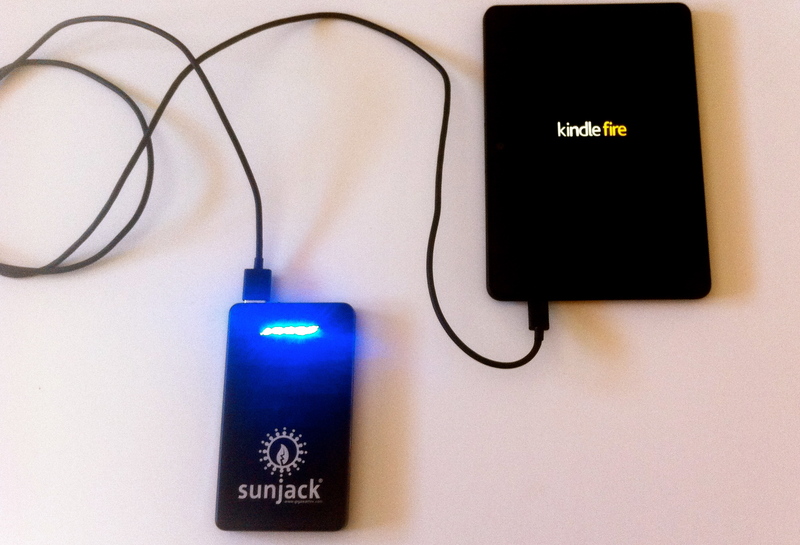 Thanks to the portability of the sunjack, charging your smartphone doesn’t have to be an added cost on your monthly electric bill. Now, charging a smartphone may not add a ton of money to your monthly electric bill, but at least you’ll have some peace of mind from knowing that you didn’t have to add unnecessary carbon emissions to the air in order to do so. GreenLivingIdeas wishes to thank the makers of SunJack for providing us a free product to review for this blog post. We really do love it! Photos are courtesy of Flickr Creative Commons (Sunset) and Pono Home. Peter Young graduated from Pacific Lutheran University (PLU) with a degree in journalism and has made sustainability and eco-conscious living mainstays of both his professional and personal life. It was during his time at PLU that he began his journey with sustainability and it's what has led him to writing for Green Living Ideas. He currently resides in Honolulu and works for Pono Home, an energy efficiency company focused on reducing carbon emissions and promoting a healthier, greener lifestyle.